In the 4 minute video below, I show you how to use the Overcast app to optimize your Spanish learning potential through podcasts. 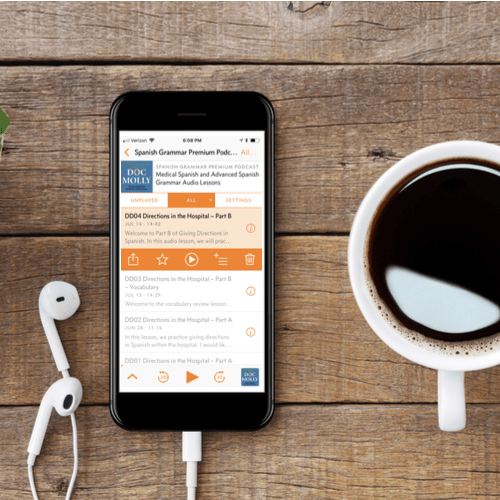 Subscribe to a podcast feed in Overcast. In the video, we subscribe to the latest premium podcast series: "Spanish for COPD." I encourage you to check out the two educational podcasts I mention in this video, Podcast de Gramática en Español and The Curbsiders, that I use for learning Spanish and Medicine. And if you have not done so already, download the Overcast app and optimize your learning potential through podcasts. I hope you enjoyed the video. Let me know your favorite educational podcast and podcast app below! Podcast Addict is an exceptionally good podcast player for Android. Thanks Chris for your comment. When I tested the site on an Android, Podcast Addict did seem the most intuitive.